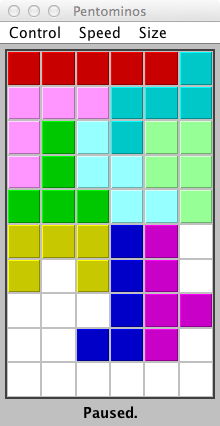 Have a pentomino tiling problem that’s got you stumped? Then perhaps the Pentominos Puzzle Solver will be right up your alley! Recently I’ve been thinking a lot about using computer programming and search algorithms to solve mathematical problems, and the Pentomino Puzzle Solver is a great example of the power of coding. 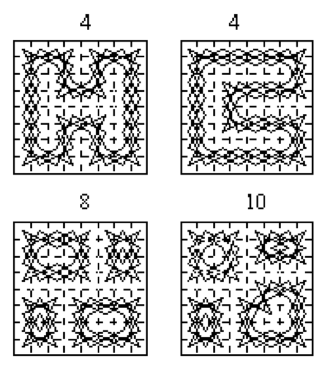 Written by David Eck, a professor of math and computer science at Brandeis University, the solver can find tilings of a variety of shapes. Watch the application in slow-mo to see how it works; put it into high-gear to see the power of doing mathematics with computers! Next, here’s a wonderful page about knight’s tours maintained by George Jelliss, a retiree from the UK. He says on his introductory page, “I have been interested in questions related to the geometry of the knight’s move since the early 1970s.” George has investigated “leapers” or “generalized knights”—pieces that move in other L-shapes than the traditional 2×1—and he even published his own chess puzzle magazine for a number of years. His webpage includes a great section about the history of knights tours, and I’m a fan of the beautiful catalog of “crosspatch” tours. Great stuff! Multiplication, addition, division: which gives the biggest result? Last but not “least”, to the left you’ll find a tiny chunk of a very large table that was constructed and colored by Debra Borkovitz, a math professor at Wheelock College. Debra describes how, “Students often have poor number sense about multiplication and division with numbers less than one.” She created an investigation where students decide, for any pair of decimals, which is biggest–multiplying them, adding them, or subtracting them. For 1.0 and 1.0 the answer is easy–you should add them, so that you get 2. .5 and 1 is trickier–adding yields 1.5, multiplying gives .5, but dividing 1 by .5 makes 2, since there are two halves in 1. Finding the biggest value possible given some restrictions is called “maximization” in mathematics, and it’s a very popular type of problem with many applications. 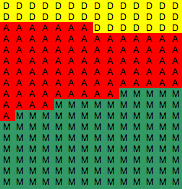 This investigation about makes me wonder: what other kinds of tables could I try to make? Debra mentions that she got the inspiration for this problem from a newsletter put out by the Association of Women in Mathematics. There’s lots to explore on their website, including an essay contest for middle schoolers, high schoolers, and undergraduates. I hope you found something here to enjoy. Bon appetit!